Preach The Word, And Lead! During the first American Revolution, many of the unsung heroes were men of the cloth who would preach about salvation for mens souls and the relationship of the same men to each other and the world around them. They spoke of the revelation of God to the world beyond scriptures in the nature of creation itself, and along with it, the concept of natural law which recognized the worth of each individual… and the rights, natural rights, that came along with this unique position. 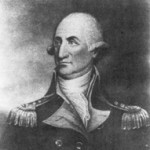 Ignored by many historians, blinded by the “separation of church and state” mantra, was the role Jonas Clark played in Lexington MA on April 19, 1775 when British troops marched into town looking for Samuel Adams and John Hancock. He had been working with the men of his congregation, preparing them for the time when it would be necessary for them to defend their homes and families. His followers were among the first on the scene to stand their ground against their masters from across the sea. John Peter Muhlenberg, a Lutheran pastor in Woodstock VA, upon hearing of the fighting in the northern colonies, preached a sermon on Ecclesiastes 3, then removed his clerical robe to reveal the uniform of general in the Continental Army. He then went on distinguish himself in numerous battles to rid the new land of foreign oppression and control. These men, and many others like them, looked beyond the four walls of their churches and took seriously their mandate to be the salt and light in their world. They understood their responsibility to spread the Word to save mens souls. They also knew that if their charges were really people changed by the gospel, it would manifest itself in their community and their world. Many, from the secular statists to the timid Christians, distressed by the concept of conflict, want to keep such religious leaders quietly contained by their church buildings where they won’t be much of a nuisance and present few obstacles to the nefarious schemes to complete the transition to a post-Christian world. Many locked into these institutions are blissfully unaware of the movement away from what used to be a Christian consensus in our country. They struggle to sing “Amazing Grace”, or some contemporary, feel-good chorus, and barely lift a finger to tell anyone about the good news. The preachers of the colonial days were not just religious or church leaders – they were community leaders. Their influence reached far beyond the walls of their church. They had something to contribute to society and were respected for it. They led with actions, not just words. They led from the front, not with the “forward men, I’m right behind you” approach. While our God is a god of peace, He is also a god of justice. The emphasis on peace can sometimes obscure the passion for right and justice. Many will preach against the horror of unborn babies having their skin burned off with a saline solution or being torn to pieces by suction in abortion clinics. How many are on the front lines actually attempting to stop the practice… even by non-violent prayer outside such places. But some say, “there are laws against this in some places”. I would suggest that taking this approach places man’s laws above the mandate from the Father to watch out for the “least of these”. Christians have rolled over on so many issues, it has become a standard practice that few even think about one more spin when any controversy arises. The flocks may fuss a bit, but that’s about all they do as the public schools do their best to mock and destroy the faith of our young, homosexuals and, now, Muslims, are pushing their agendas while Christians are told to sit down and be quiet. All these instances are just symptoms of the downward slide our country has been in for many years. Like the spendthrift economic policies that did not begin with the current administration, their damaging effects have been known for years. Many Christians are waking up to the disasters that loom before us. They need leadership to help give them direction and keep them on track so our resistance remains based on principle and does not degenerate into retribution when things start going even worse. These colonial pastors preached the Word and led on the battlefield. They didn’t hide in the safety and partial anonymity of the pulpit. We need this kind of leadership today, just as much, if not more, than we did in the days of America’s original freedom fighters. While we like to comfort ourselves with the thought that we can accomplish all that is needed with a few visits to the voting booth, and we hope this is true… it may not be the case. Are we prepared? Are our spiritual leaders prepared?